Froogle is a product-based search engine that is a sister company of Google. Froogle attempts to find the most relevant products based on your search terms that you enter into the search engine. In order to be in Froogle, you have to have an e-commerce website where products are available to buy. Many people who are wanting to shop for the best values on the product that they're looking for will type in detail, the brand and product name. After searching for this information, Froogle gives them a list of results with the prices and a picture, then links directly to the page on your site where the customer can purchase the product. The way that Froogle works is, the webmaster or marketer of your website includes a spreadsheet in their "Google Base" account. This spreadsheet includes the Product Name (title), Page (link), picture of the product (image_link), price of the product (price), a description (description), and more detailed information. Although it's growing, not a lot of people search Froogle on their own, luckily Google puts Froogle results at the top of the natural searches. 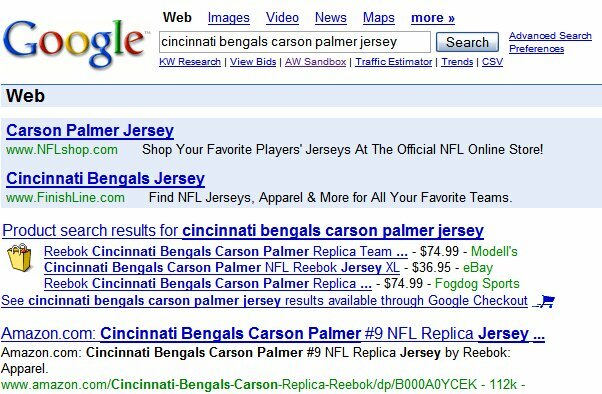 By putting theses listings up there, online shoppers can click a link for "Product Search Results" which takes them to Froogle to search for the product that they just entered. See the image below. At Altherr Web Design, we use Froogle for many customers managing online e-commerce websites. This is not a one-time thing, since products expire every 30 days and new products added to your store must be updated. We can manage your Froogle account for you, regardless of how many products you have. Prices for this product start out at $25 and go up depending on the number of products that you have to be entered.